Wai-Man Woo stands in front of anatomical charts with Chinese writing. 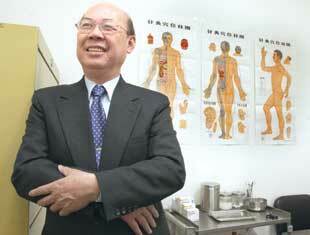 Wai-Man Woo was a high school student in Hong Kong when acupuncture changed his life 45 years ago. His rheumatism acted up while he was on a school trip with classmates, leaving him unable to walk. Woo said he contracted the disease as a child after his family fled the Japanese invasion of Hong Kong during World War II. They slept outdoors in damp fields, which Woo said he believes led to a debilitating stiffness in his legs. As Woo watched his classmates scamper around the island that is now the site of the Hong Kong International Airport, a friend offered to cure his nearly paralyzed legs with a needle. "He put it in there, and the heaviness went away," Woo said. The boy's father was an acupuncturist. After a few treatments with his friend's father, Woo said, his rheumatism subsided for 20 years. "I was skeptical too," he said. "But it happened to me." Decades later, Woo operates an acupuncture business in the Heights. It was 24 years ago today that he and his family drove into Billings to set up his business, which for 23 years was on Wicks Lane. Last June, Woo moved the business to 1327 Main St. In 1980, Montana was the only state that allowed acupuncturists to practice without the supervision of a medical doctor, Woo said. "People in Montana are the lucky ones that way," he said. "They have more available to them." Woo had spent a year in Boston training at the New England School of Acupuncture, which he said was the first acupuncture school in the United States to obtain legal status. In a twist of fate, his instructor was the man who treated him as a high school student in Hong Kong. Woo didn't expect to make his career in acupuncture. He studied pharmacology, and worked for eight years as the head pharmacist for an Illinois hospital. But his wife, Sui-Ming, who is the librarian at Sandstone Elementary School, developed severe lower back pain after delivering the couple's third child. Acupuncture relieved her pain, but, because the practice was not accepted in the United States at that time, she had to travel to Hong Kong for treatments with her acupuncturist cousin. "I said, 'What happens the next time you have back pain? We cannot afford it,' " Woo said. "Why cannot I learn it myself?" So he looked up his old high-school friend and learned that his father was teaching acupuncture in Boston. After completing his training, Woo said, the Illinois hospital offered him his job back. He could have returned to work as a pharmacist and at the same time use his training in acupuncture to help his wife when her back pain flared up. But Woo said that didn't seem like the right thing to do. "Why don't I do it to benefit other people, too?" he asked. As a pharmacist, he could have only dispensed medicine as ordered by someone else. But, as an acupuncturist, Woo can do more to help people who are suffering. "Here I can help in a more broad area," he said. Diane Cochran may be reached at 657-1287 or Diane.Cochran@lee.net. Acupuncturist Wai-Man Woo said the first question most clients ask is, "Does it hurt?" "Not everyone likes needles," Woo said. "I will ask them, are you hurting now? If they say yes, I say, then why are you afraid of hurting?" Because every person's pain threshold is different, Woo can't tell people what to expect during their first acupuncture treatment. "Some people can stand a shotgun wound, and some can't stand a mosquito bite," he said. "They will feel a sensation." Woo said acupuncture can relieve symptoms of depression, morning sickness and menopause as well as ease a slew of muscle and joint pains - even help people quit smoking. "People have got to be willing to try," he said. "Most people ask, 'Can you help me?' I say, 'I help a lot of people, but everyone is different. The one thing I cannot fix is a broken heart.' "
Traditionally, acupuncture is believed to alleviate ailments by adjusting the flow of energy in the body. Acupuncturists rely on 14 meridians, or energy pathways, and 360 energy points. "It is abstract - not tangible," Woo said. He compared energy traveling along a meridian to the way a cell phone signal travels through the atmosphere. "We didn't see it, but it works anyway," he said. "You open up the sky, and there are no wires there." When a body is healthy, energy flows freely along the meridians, keeping it in harmony. But, if energy is interrupted, pain or other symptoms develop, Woo said. The trick of acupuncture, he said, is to find the blockage and clear it. "It's just simple," Woo said. "Each point has a particular use." Woo views the energy points as medicines for the body, and it's up to him to determine which one to prescribe. "The needle is going to unblock it," he said. "It brings energy from other parts to (the blocked area)." Some symptoms can be alleviated with as few as two needles and a 10-minute treatment, he said. Others might require as many as 30 needles and up to two hours. "Even the same problem can be different in different people," Woo said.